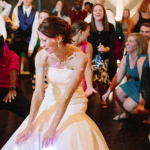 Weddings are wonderful days of celebration, but if you want something a bit different we have got 10 incredibly cool wedding entertainment ideas that will ensure your guests remember your wedding for years and yet do not have to cost you a lot of money. 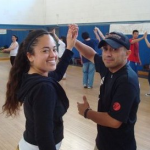 Hire a dance instructor to teach your guests an easy fun dance they can do together. Keep the teaching under ten minutes and choose a song or dance that ties in with your ethnic background or with your personalities or hobbies. Let guests know why you’ve chosen the song, to encourage them to join in. If dancing isn’t your thing have a sing-along. 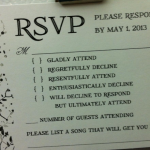 Add a few lines to your RSVP card asking people for their song choices so that you advise the band in advance. 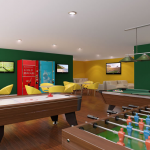 If you have children at your wedding, set up a games room with a ping pong table, video games and a popcorn machine. Add special lighting to create an arcade feel. You may find adults use this room too. For truly cool wedding entertainment, hold your reception at your local zoo. Arrange for the zoo to allow your guests to spend time with some of the animals during cocktail hour. Petting a baby alligator or getting up close to a python is a hit for both adults and children and is certainly a wedding they will remember. Book a video booth for your guests to record their good wishes for you as a newly-wed couple. If you’re getting married outside, surprise your guests before you walk down the aisle by booking a helicopter to fly overhead to video and take photos of your wedding party from the air. Get the pilot on loud-speaker to ask the crowd if they’re ready for a wedding and encourage them to wave ‘because you are on camera and it is your turn to shine! The photographer will be able to get great close-ups of all of the guests. Have the DJ announce there will be a “toast and roast of the bride and groom” and then allowed people to come up to the DJ booth and fill out a card with their best toast or roast of the bride and groom. Then during dinner the bride and groom quickly look though the cards and choose the top 4 or 5 to give speeches. It is fun, weeds out distasteful stories and will help guests to know you better. Already a hit at the MTV awards, update the guest-book idea with a digital graffiti wall. No mess, no fumes infrared technology means that your guests can try their hand at wielding a spray can with no risk attached. Photographs are projected onto a digital wall and then various colours, effects, stencils, stamps and patterns can be added. Once complete the creations can be printed, emailed or uploaded to Facebook. ‘Pixpod Booths’ have room for up to eight people, props and even a wind machine included, for your guests to create unforgettable images. Four photos are taken in 12 seconds and the booths use green screen technology so you can choose your background. There is also a password-protected online gallery available later where images can be downloaded free. Candy floss takes everyone back to the fun of childhood and when you have such great flavours such as sassy apple, blue raspberry, or the more adult pina colada on offer, that’s a cool wedding entertainment idea. 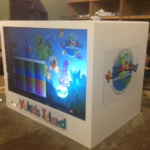 Hire a candy floss machine, choose LED floss sticks and watch everyone be kids, having fun.